Can you afford not to take the leap? Learn how a loyalty program’s data strategy can deliver enterprise-wide benefits and results. 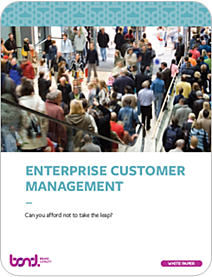 Enterprise Customer Management (ECM) at its core is an organizational wide approach to placing the customer at the center of all business decisions. By harnessing customer behavioral, transactional and social data many organizations are embracing this defined discipline to help inform optimal decision making across all facets of their enterprises. The benefits can be everlasting allowing brands to connect and be relevant with their most valued customers across all dimensions of their value proposition.